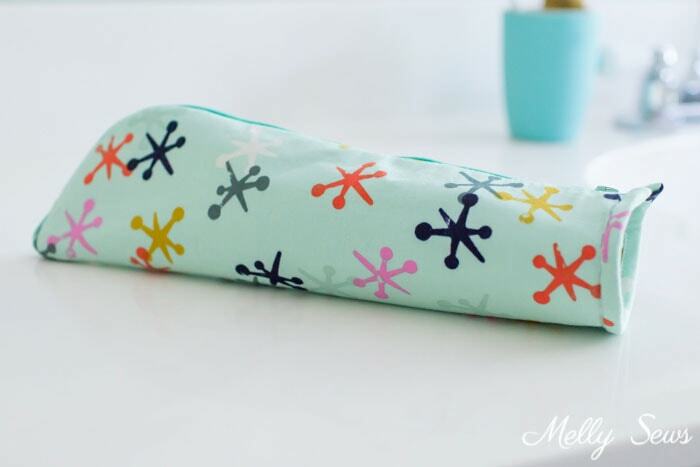 Sew a Travel Case – Using a Free Pattern! Hey y’all, welcome to July where this month’s blog theme is travel sewing! 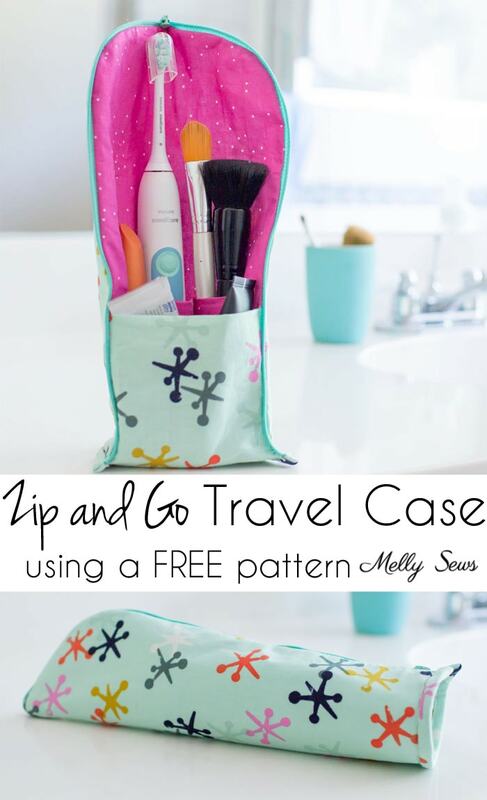 Today I’m sharing how you can sew a travel case – with a video I used for this zip and go one I sewed up. I love the way it stands up and holds things in their places! When I was a teacher, I rarely traveled for work, and almost never outside the state. I say almost never because one year I did win a grant to train with Shakespeare and Company in Massachusetts, but other than that I stayed within the Texas borders. But now that this is my job, I travel a lot more, and I’ve become pretty good at traveling light – because I don’t want to lug a heavy suitcase! 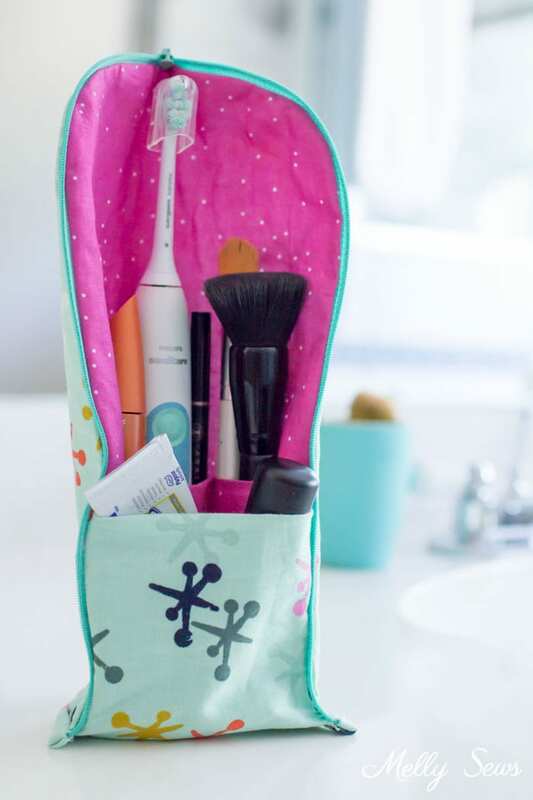 This little project is perfect for the way packing my toothbrush and makeup essentials. I almost always leave those until the last minute to pack since I have to use them before I head to the airport for an early flight. So with this project, I can just add them as I use them and then zip and go! Want to make your own? The project, pattern and tutorial are available from Sue O’Very Designs for FREE! I will say, this is not a beginner project. Sewing that base is a little tricky, so beginners might prefer these zip pouches. Here’s the video of how it’s constructed. 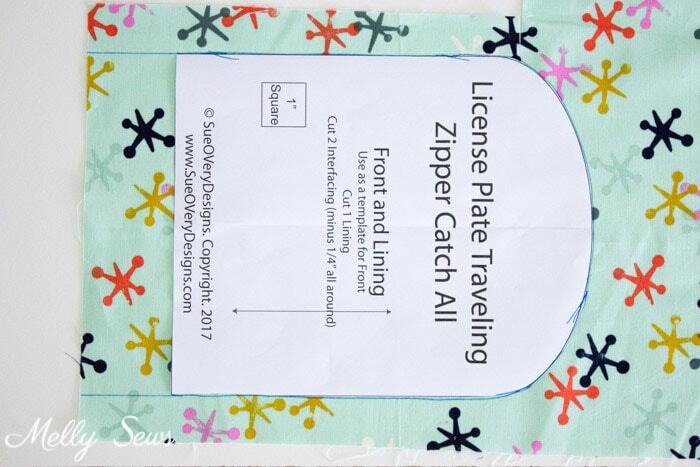 Go to the Sue O’Very Designs site to download the pattern – read carefully and you’ll see the links for the front and base pattern pieces, as well as a list of rectangular pieces to cut. I made a few alterations to her project. First, I did not do the piecing for the outer fabric, I just used the lining piece to cut a front out of this Cotton + Steel Playful Jacks fabric. And since I know my toothbrush is tall, I added 2 inches to the front/lining piece as shown below. That way I knew my case would be tall enough for my toothbrush. 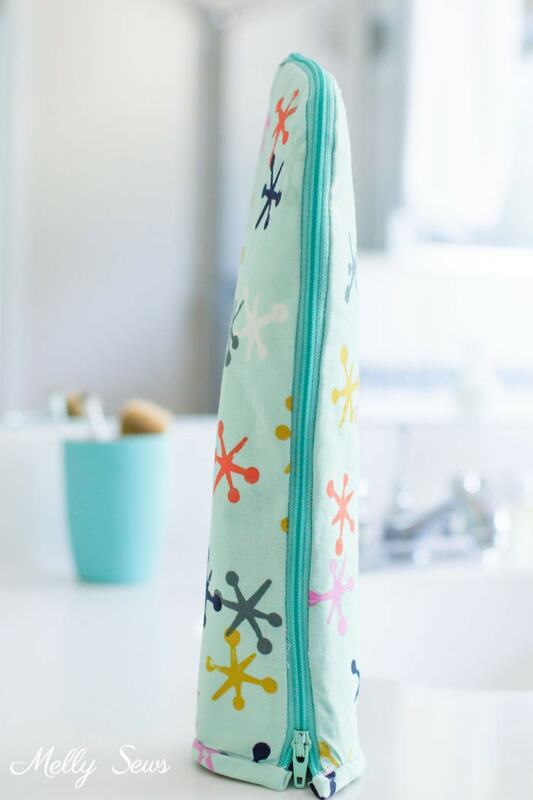 The lining fabric is Cotton + Steel Sprinkle Stardust in Petal, but I couldn’t find it in stock to link for you. You may be able to find cuts on Etsy or something though if you have to have it. The final difference in the way I sewed my case – I had to use pins. Wonder Clips just weren’t holding things together well enough for me, especially with the narrow 1/4 inch seams, so I reverted to my tried and true pins. I think if I make another, I may also experiment with slashing the pattern vertically and spreading it a bit to make it a little wider. If you do that, you’d have to do that to the base, pocket and front pieces, as well as making the binding longer. But I think it might be nice to have another of these that can fit a few more things. I also think a slightly wider base might make it even easier to stand. I really like the stand-up tooth brush holder It is so neat!